Becoming a member of the Oregon chapter of the Association for Contextual Behavioral Science (OACBS) is quick and easy! We do not require you to complete an application form or pay dues directly to OACBS. However, we do require you to join and remain a current member of the Association for Contextual Behavioral Science (ACBS). ACBS membership grants you access to a wealth of ACT and CBS resources, treatment protocols, and listservs. ACBS dues are “values based,” such that you can choose how much you are willing to contribute for your membership, based on your ability to pay and your honest assessment of how much the community fits with what you want to be about. Join ACBS now by clicking here. 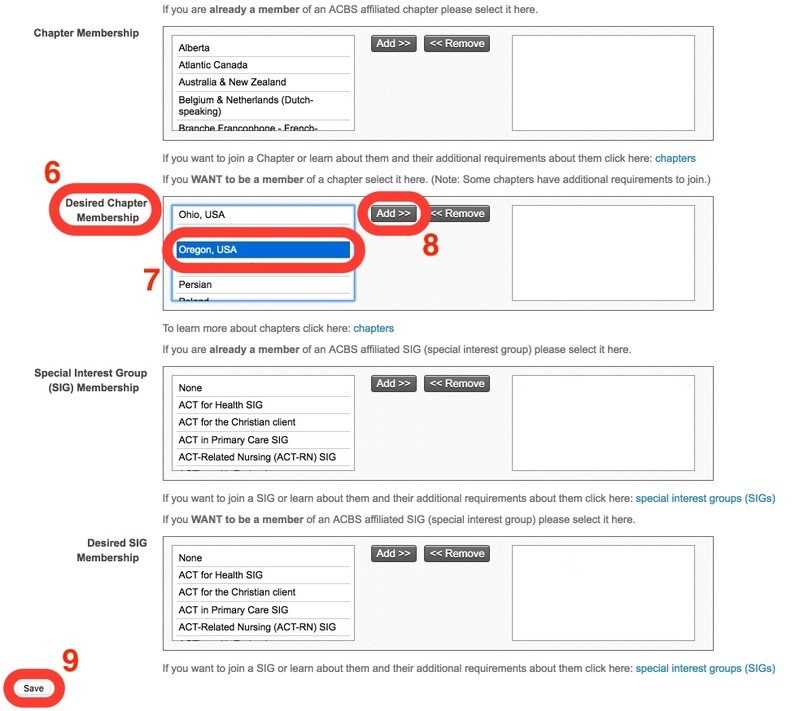 Follow Steps 6-9 (shown below) to indicate that you would like to join OACBS. Once your ACBS membership is verified, you will be added to the OACBS membership roster. Log in to your ACBS account by clicking here. Enter your email or username and password, and click Log in. Scroll to the Desired Chapter Membership section. Scroll through the options and select Oregon, USA. Click Add>>, and Oregon, USA will move to the box on the right. If you have questions about joining OACBS or about your OACBS membership, please contact the President.